8000 sqft Indoor & Outdoor Showroom, Over 100 Granite Colors in Stock! Choose the color and pattern of your granite countertop and pick edge profile, backsplash, and other options. We carry only premium quality granite countertops NJ and have 1000 slabs in over 100 colors in stock. Fabrication, edge treatment, sink cut out and installation come free of charge! Browse our granite countertops and schedule an appointment with us today by filling out our contact form or by calling us at 973-302-2075. Our expert designers will measure your granite countertop and do the templating for your kitchen remodel. We provide a 3D design of your kitchen remodel ideas and customize for you. We will do the fabrication in our facility and schedule a time with you for the installation. We usually do it one week after templating is done. Once your granite countertop is installed, you will be able to enjoy its beauty & functionality for years to come! We offer the best granite prices in NJ! 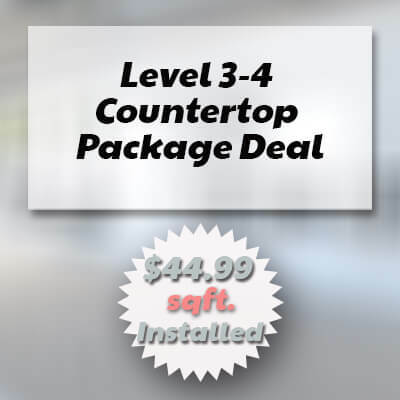 The cost of granite countertops is so low that you pay wholesale prices because we cut out the middleman markup. 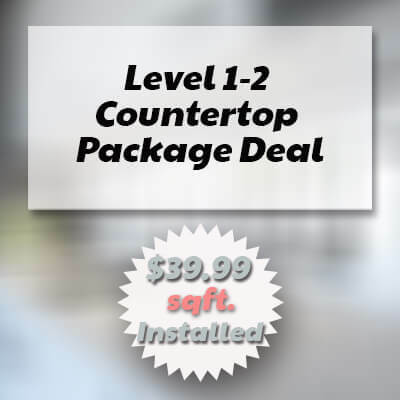 You get free fabrication, installation, edge treatment, and free stainless steel sink when you purchase your countertops from us. That is saving over $675! Countertops price you see, is the price you pay. Start your free granite countertop estimate today. Aqua Kitchen and Bath Design Center provides free template and design for your new kitchen countertops. 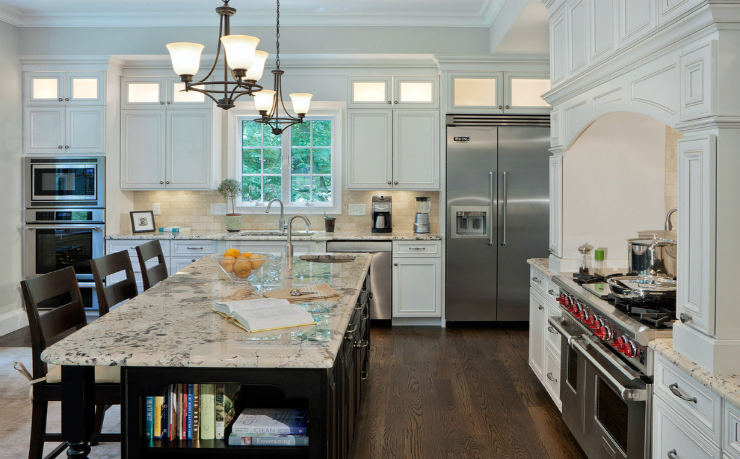 You will work with our professional designers to model your dream kitchen with our unique granite slabs NJ. 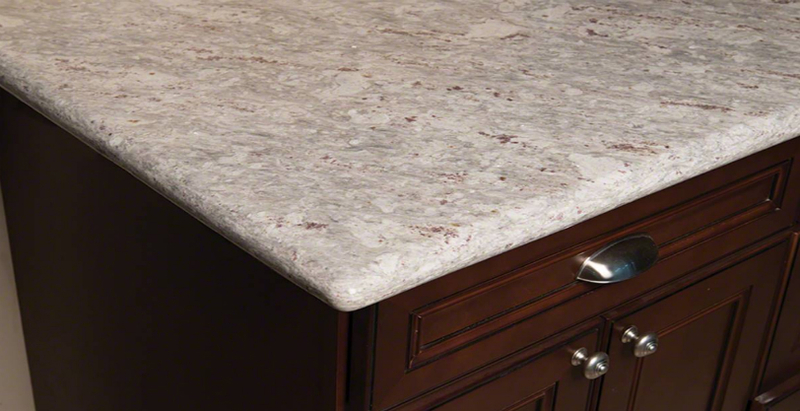 Give your kitchen or bath countertops a complete makeover with the stunning look of granite. Granite NJ is available at our Wayne granite slab yard where you can choose among many unique options. Low granite countertops cost and beautiful, artistic look will make your home truly one of a kind! Always go with a real fabricator with proper licenses and insurance. Do not go with contractors or freelancer shops who do the granite cut in their driveway, yard or garage. 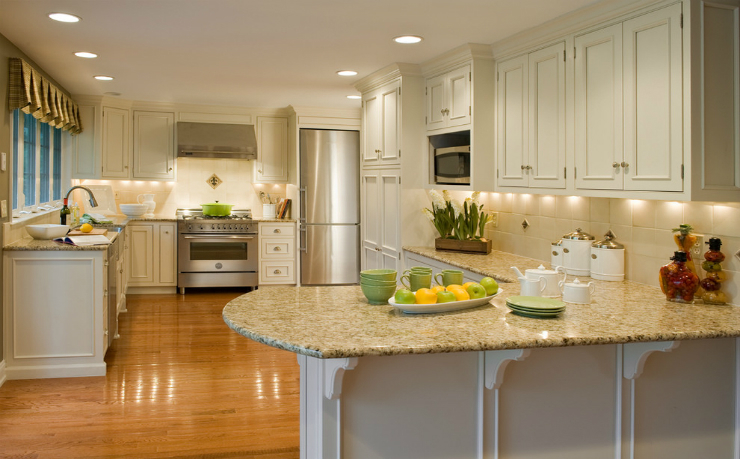 Improper cutting and fabrication of granite countertops can cause serious health issues! Aqua Kitchen and Bath Design Center does fabrication using professional cutters and advanced machinery in a large facility next to our showroom in Wayne NJ. We also have a large slab yard onsite that you can walk around and pick the best color and stone. Gorgeous granite countertop colors at low cost are available to you at our Wayne NJ granite countertop shop. 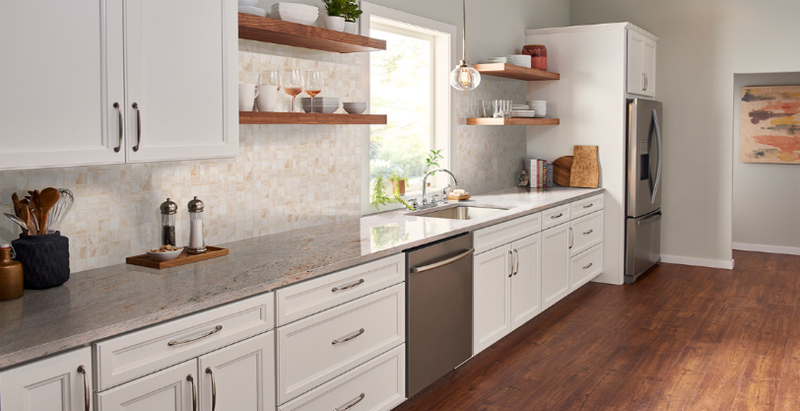 Durable, resilient, and absolutely unique, granite countertops will make your kitchen or any other room a one-of-a-kind space. Creating a dream kitchen is so easy when you decide to use granite. It’s just a matter of what colors you prefer. Stop by our granite countertops NJ slab yard and choose your favorites among many beautiful granite slabs! 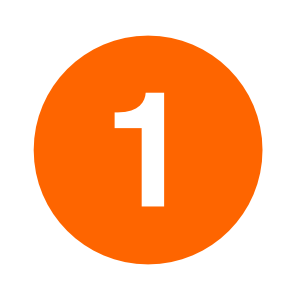 Our team of fabricators, designers, and installers is in business for many years. Aqua Kitchen and Bath granite countertop slab yard is conveniently located in Wayne NJ, easily reachable from any place in NJ and surrounding states. We will be happy to help you choose the best granite countertop colors, patterns, and edge profile for your kitchen remodel. Save money on granite countertop installation cost – we do it for free. When we receive your order, you can schedule the time for our team to come to your home or business and take measurements. They will come back to install those perfect granite countertops. We choose only the best granite slabs of premium quality, with gorgeous colors and patterns and superior strength for your NJ home. When you shop granite countertops from us, not only that you get a unique kitchen countertop that will last you a lifetime with moderate maintenance – we also give our maximum every single time to make this shopping experience convenient and pleasant for you. Contact us and we’ll give you a free estimate, free edge treatment, free fabrication, free sink cut-out, and free installation. Simplify your life and enjoy your kitchen remodel by shopping granite countertops in NJ with us today! Looking for New Granite Countertops NJ? 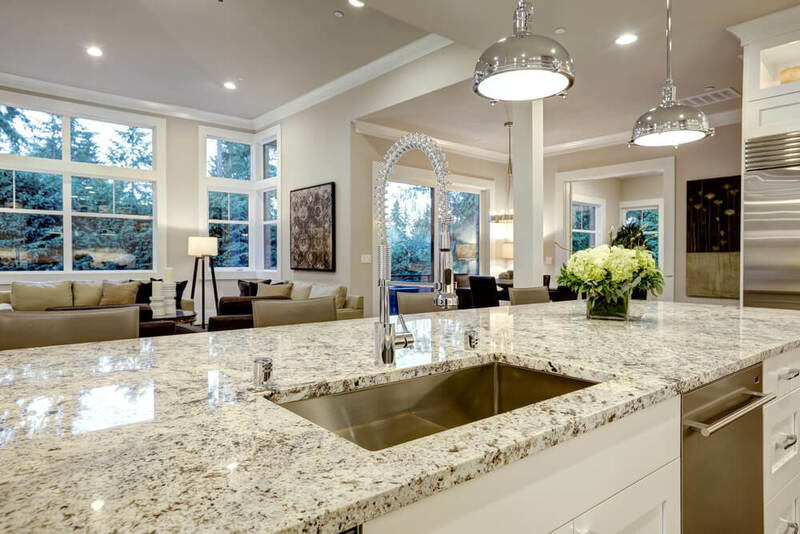 Before you start looking for the best Granite Countertops NJ that will be able to match your needs and plans, as well as your budget, follow our Ultimate Granite Countertops Buyer’s Guide for the best shopping experience. You want to remodel your kitchen but you wonder how expensive are granite countertops? 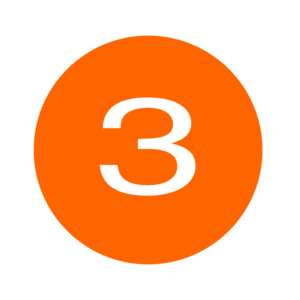 Don’t worry, we got you covered with our best cheapest prices on granite NJ. Shopping for 100% unique, gorgeous looking, high-quality, natural Granite Countertops in NJ at a low price with free fabrication, edge profile, sink cut-out, and sealer application that will match your needs, style, and budget has never been easier. Aqua Kitchen and Bath Design Center located in Wayne NJ will give you all this, plus free granite installation NJ service. Visit us, choose, request a quote, and schedule a templating and installation service visits at your convenience. Giallo Ornamental Granite is a classic among granites. It proves timeless not only because of its natural versatility but also because of its convenience and ability to perfect many different interior designs. 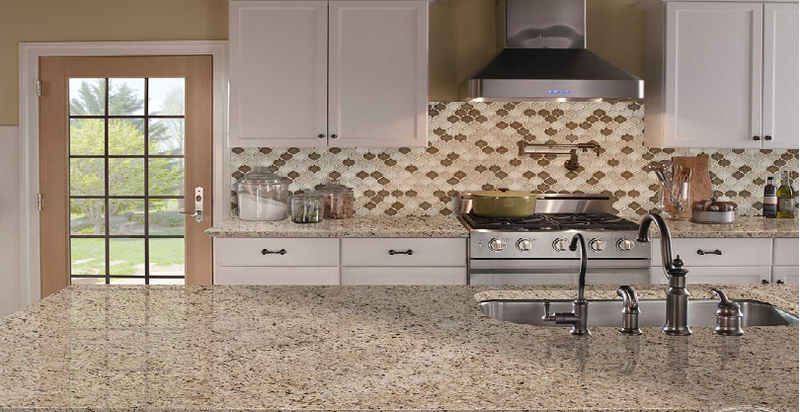 The light, creamy base color with dark, almost black flecks of Giallo Ornamental Granite makes it goes beautifully with almost any kitchen cabinet color or stain. Choose the perfect slab of Giallo Ornamental Granite at our Wayne NJ slab yard and use it to complement your kitchen, whether it’s style is traditional or modern. Its beautiful colors will add interest and the perfect focus. Black granite is very popular in general. It looks sleek and gives a striking effect to any kitchen. Black Pearl is one of those dark granites that is not simply black – it has countless speckles of blacks, golds, silvers, browns, greens, and various shades of gray. With granite, it’s never plain, never simple. Each slab of Black Pearl Granite features an abundance of colors and with them, opportunities. Find Black Pearl Granite at Aqua Kitchen and Bath Design Center’s granite slab yard in Wayne NJ at a low price and give your kitchen what it deserves. 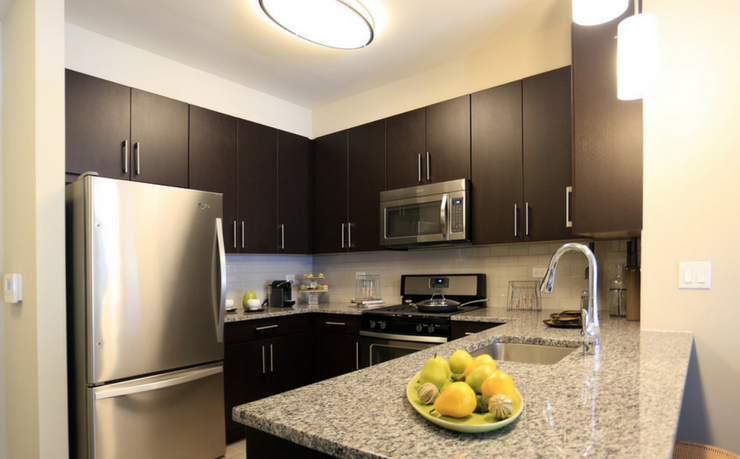 Black Pearl goes well perfectly with beige and white kitchen cabinets and stainless steel appliances. But of course, this is only one of the design options you can choose. Our designers and fabricators will help you with various kitchen and bathroom designs, from the ideation to the delivery and final set up. If you love warm colors and gentle tones to surround you in your favorite room, choose New Venetian Gold Granite countertops. This is a Brasilian stone that looks like its made out of Brazilian sun and gorgeous Brasilian lands. 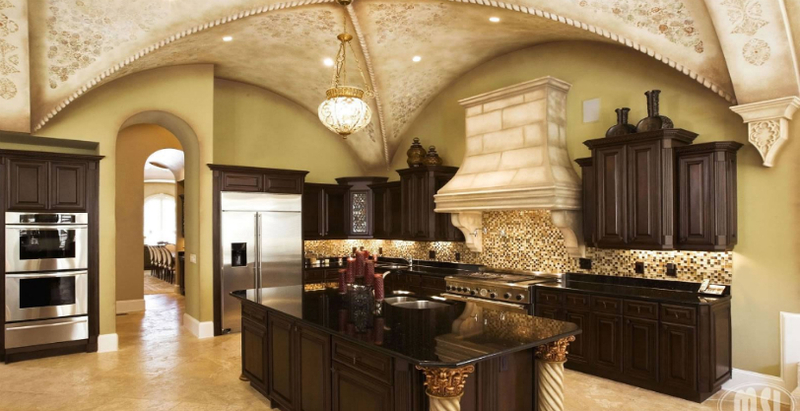 With the outstanding looks that can tie together even the most unexpected kitchen decor elements, the gold color of this natural stone gives a touch of glamour and richness to any kitchen. 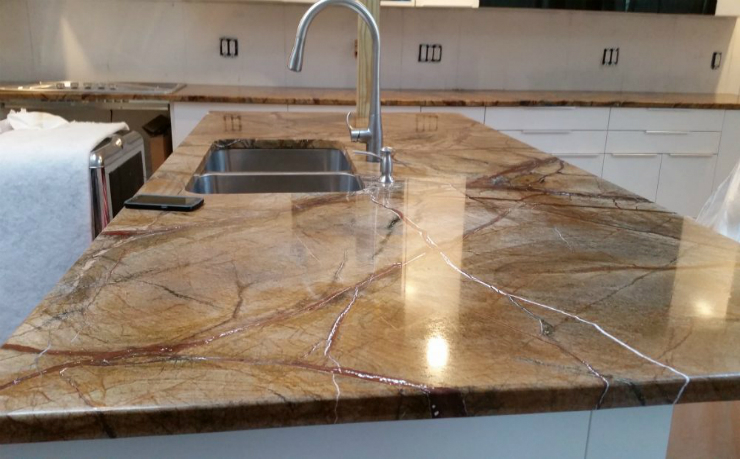 Incredibly resistant to frequent, everyday usage, impacts, scratches, stains, and spills, New Venetian Gold Granite is perfect for high-traffic kitchen spaces. If you want that feel-good sensation and the feel of freedom in your kitchen, come by our granite slab yard in Wayne NJ and take a closer look at our New Venetian Gold granite slabs. We are certain that you will find the one just for you. Juparana Delicatus Granite is a natural stone with a striking pattern of strong colors, shades, and specks. This is a dramatic looking black and white stone featuring high-intensity veining and color variations. Deep, rich colors give depth to any kitchen space while unique patterns of colors and shades create an ultimate style statement. If you decide to go with Juparana Delicatus Granite countertops for your next kitchen remodel, be sure that they will give you a chance to relax and really enjoy the process of cooking and socializing in the kitchen. Everyone will compliment their incredible durability and stunning looks! This natural stone abundant in its appearance may look dense but this feature varies from slab to slab. Overall, Santa Cecilia Granite is absolutely gorgeous! Granite suppliers, fabricators, interior designers, and homeowners recognize it by its soft beige color with veins, shades, and speckles of dark gray, gold, and burgundy color. It’s simply impossible to describe Santa Cecilia Granite in detail because each slab is different and 100% unique. Different people will like different details in this stone. Some will be drawn to its cranberry-colored spots while others will be enchanted by Santa Cecilia’s gold shimmer. It’s not that rare to see taupe or orange stripes running through this granite stone. Make sure to visit our large granite slab yard in Wayne NJ and check out the Santa Cecilia granite slabs we offer. They are 100% top quality and we will customize any way you wish. Aqua Kitchen and Bath Design Center has done countless projects across New Jersey. Wherever we were needed, we were happy to be of assistance. Our dedicated team of designers, fabricators, and installers knows that a kitchen renovation is a big deal and that it takes a lot of energy and investing. Making your kitchen remodel ideas come true with a minimum of effort and budget on your side is our mission and our main goal. We offer you not only a unique space where you can come, choose the slabs you like and customize them the way you need them. Offering resources like Types of Granite Countertops and Types of Kitchen Cabinets, will make your selection process much easier. 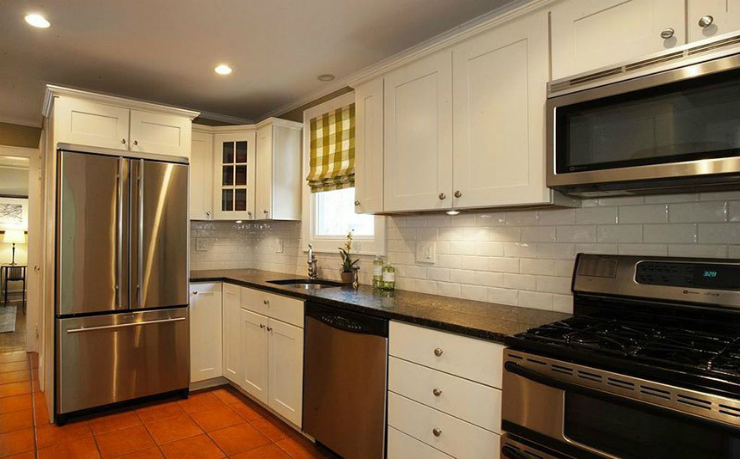 Use these resources we prepared for you and plan a complete kitchen remodel. Come and choose the best granite countertops NJ we have to offer and combine them with the best kitchen cabinets NJ. 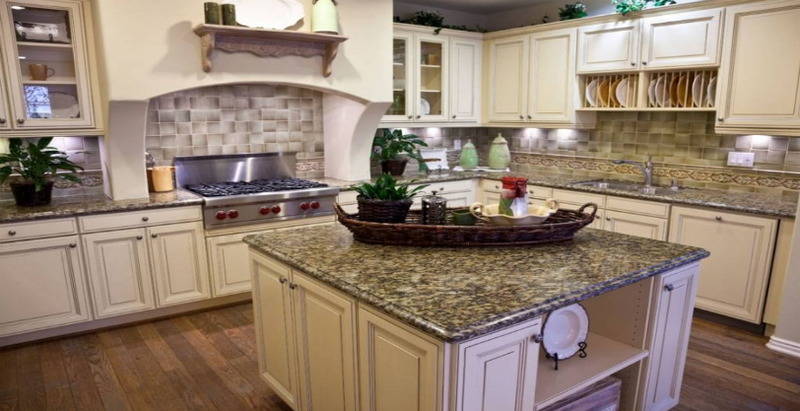 We offer amazing Kitchen Cabinets and Granite Countertop Package Deals that you simply won’t be able to say no to. After you choose your granite slab and decide on the type of edge, we will do the templating, fabrication, and then come to your home or office and install it. Take a look at some of our Projects and start planning your new kitchen with us. We installed this lovely Giallo Fiorito yellow granite slab in a Fair Lawn NJ kitchen. Paired with white kitchen cabinets, it shines even more than it usually does! Sometimes, great design is all about bringing out the best in different elements. Its earthy, yellow, brown and gold shades, and abundance of movement, Giallo Fiorito Granite adds perfect interest to this kitchen. 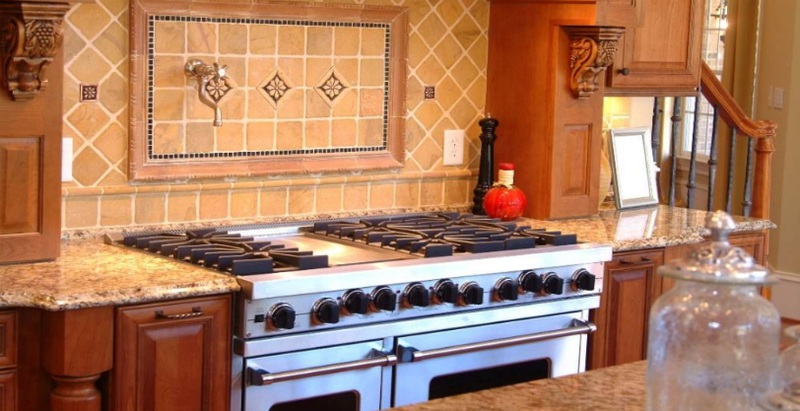 Contact us today for your kitchen remodel project. Aqua Kitchen and Bath Design Center team of installers installed 78 New Caledonia Granite countertops in this luxury four-story apartment building in the Tuckahoe Village NY. 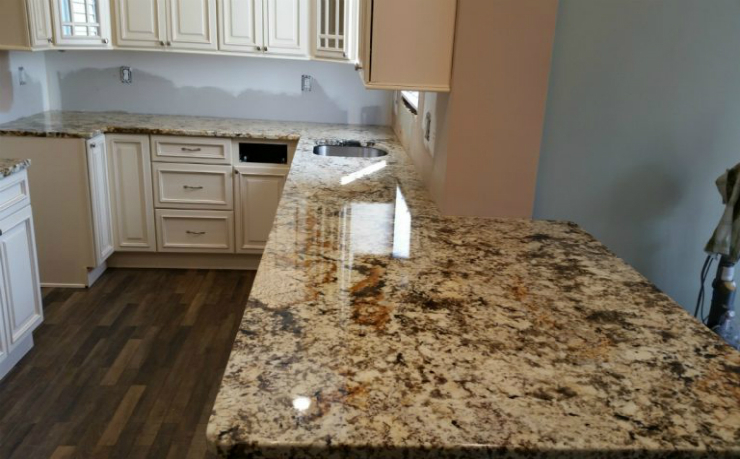 New Caledonia Granite Installation at Quarry Place Tuckahoe, NY shows that we are not ready to carry out only small, individual projects, but even bigger residential and commercial projects, too. Contact us today for your residential or commercial remodel project. Being able to help create truly unique, even exotic and highly effective interiors is not an everyday opportunity. Being able to help in creating a completely unique kitchen space with Rainforest Brown Granite Countertop Installation in Englewood, NJ was a pure pleasure for us. Make a high impact on your surroundings, visit our slab yard in Wayne NJ and do your next project with us. Contact us today! Aqua Kitchen and Bath Design Center offers you the best, cheapest prices on granite in NJ. Here, granite countertops are always on SALE. Installation, fabrication, edge treatment, installation, and sink cut-out are included in the price. Available colors change daily. If you want more granite colors to choose from, browse through Granite Countertop Colors $39.99/sqft deal and choose between Santa Cecilia, Uba Tuba, Turtle, Giallo Fiorito, Black Pearl, and New Caledonia Granite. New Caledonia Granite is primarily gray stone that can vary from charcoal to light gray. It looks great both in modern, contemporary kitchens and traditional and ornamental kitchen settings. You can expect to pay for New Caledonia Granite about $42.94 per sq ft, but here, at Aqua Kitchen and Bath, you will pay only $39.99/sqft and get free fabrication, edge treatment, estimate, and installation. How much does Black Pearl Granite cost? This is an elegant, powerfully looking mid-range granite stone that usually costs between $40 and $50 per square foot. 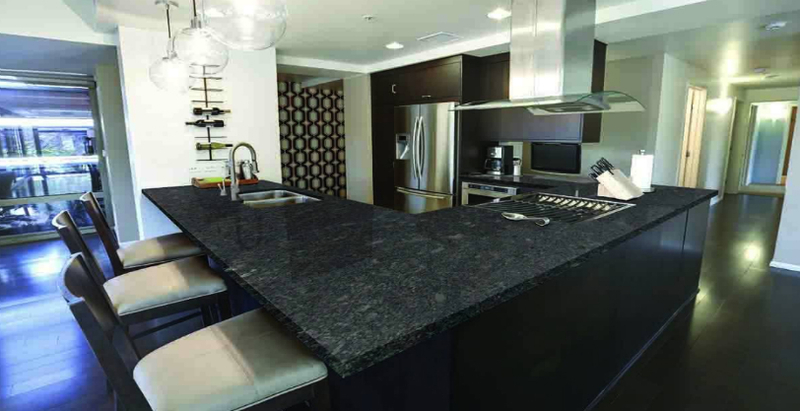 At Aqua Kitchen and Bath Design Center, Black Pearl Granite will cost you only $39.99 per sqft. 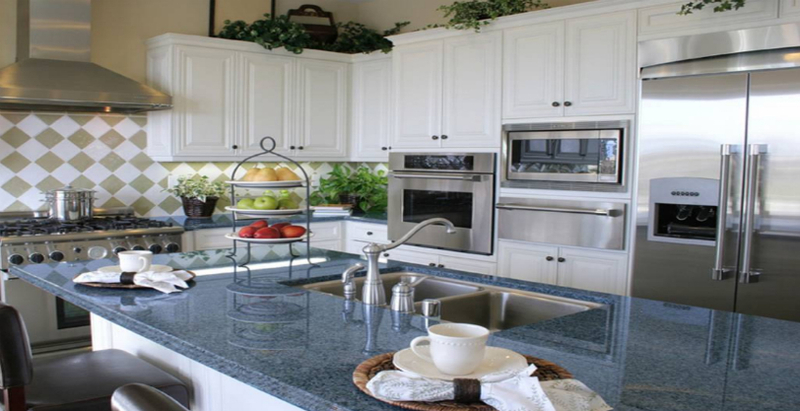 We bring you premium colors of granite countertops in NJ at wholesale price. Giallo Ornamental, Steel Gray, New Venetian Gold, River White, Baltic Brown, African Persa, and Alps White granite can powerfully transform your New Jersey kitchen. How much does River White Granite cost? Anywhere from $45 to $55 per sqft. We offer this beautiful white and gray granite stone at a low price of $44.99/sqft. White, gray, burgundy and event blue tones intertwine in River White Granite to offer you an ultimate experience. We bring you an option to choose between 8 superior granite colors, best in class: Typhoon Bordeaux, Bianco Antico, Black Galaxy, Blue Pearl, Crema Bordeaux, Juparana Delicatus, Solarius, White Spring, and White Ice. How much does Black Galaxy Granite cost? The average price of these cutting-edge kitchen countertops is roughly from $70 to $90 per square foot. Although the price mostly varies, you can find Black Galaxy Granite at Aqua Kitchen and Bath Design Center at a more affordable price — $54.99/sqft, including fabrication, edge treatment, and installation. Aqua Kitchen and Bath Design Center brings you the best granite prices in NJ. Whether you need granite countertops for a residential or commercial project, these best, cheapest prices on granite in NJ will make your project more affordable and successful. Stop by our slab yard in Wayne NJ today to choose the best granite countertop deal for you. On the contrary, granite is one of the most affordable countertop materials on the market today. The cost usually depends on the kind of granite slab you choose, on the number of slabs, the kind of edge you choose and other modifications that you require. 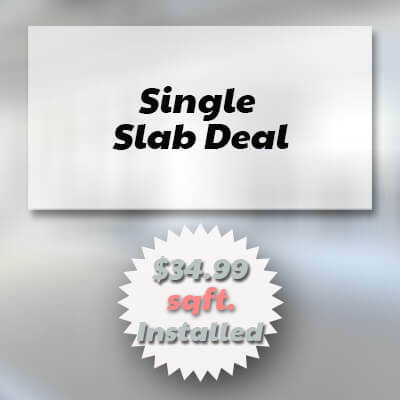 At our slab yard, the price varies and goes from $39.99 to $44.99 and $54.99 per sq ft installed, with no hidden fees. Free estimate, free edge treatment, free fabrication, free sealer application, and free installation are included in this price. Can my cabinets support my new granite countertops? Granite countertops are heavy and can weigh up to 30 pounds per square foot. 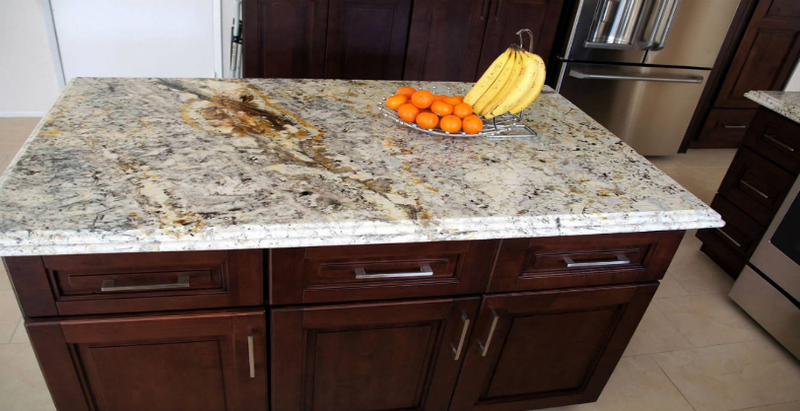 When we come to your place to do the templating, we will talk to you and personally make sure that your cabinets can carry the weight of the granite slab you choose. 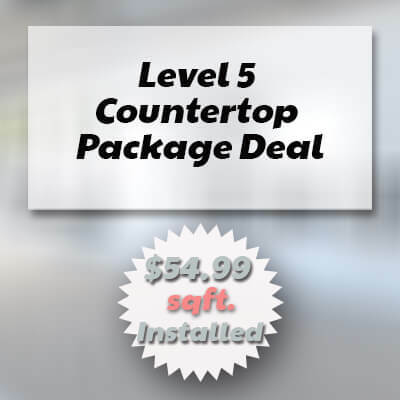 We will seal your new granite countertops as soon as we install them in your home. In general, it is recommended to seal your granite countertops once a year for the best protection and performance. How do I maintain my granite counter? 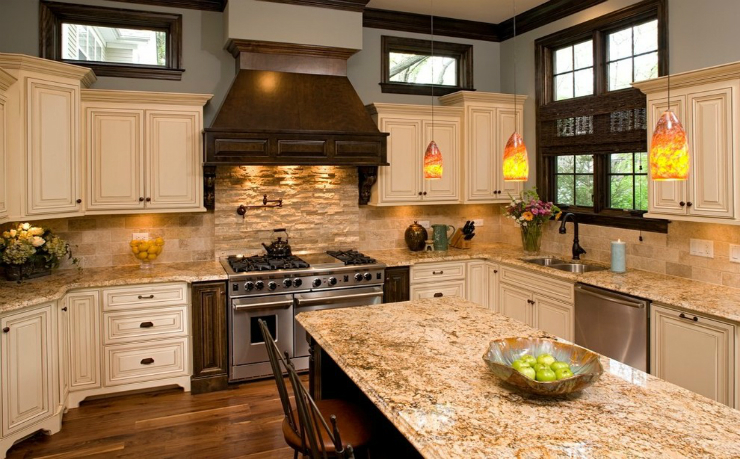 Granite countertops don’t require any special care. 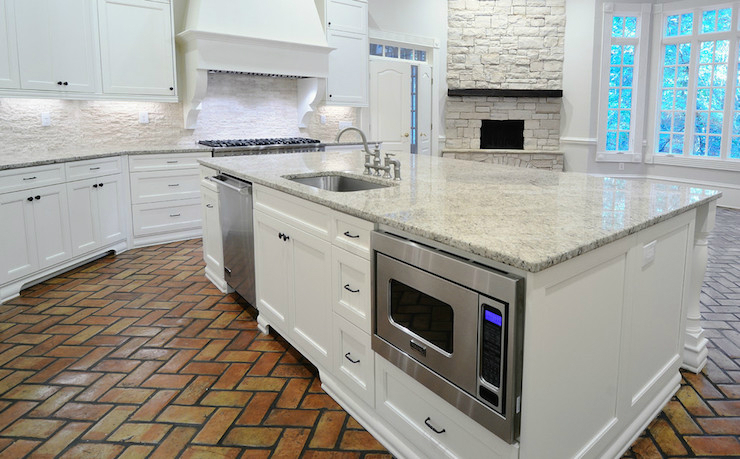 When sealed properly, granite is absolutely stain-free, chip-free, and crack-free! On a daily basis, simply use a dish cleaning liquid with mild water and a soft cleaning cloth. Nothing else is needed to make it look its best. 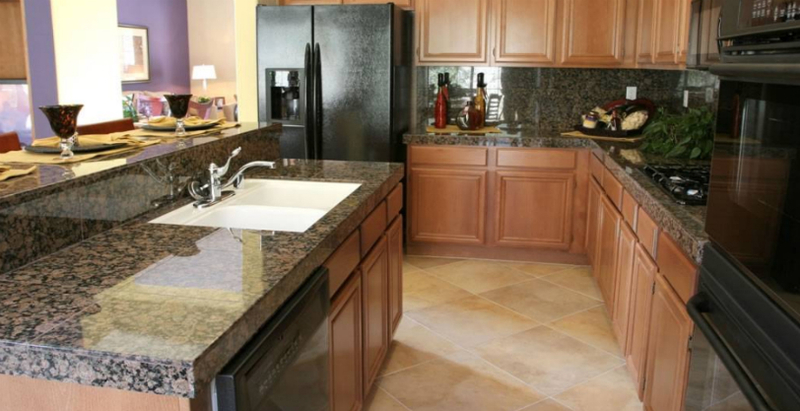 Make sure not to use abrasive or acidic cleaners to clean your granite countertops. We also don’t recommend using hot pots and pans directly on the surface of the stone. How can I disinfect my granite? 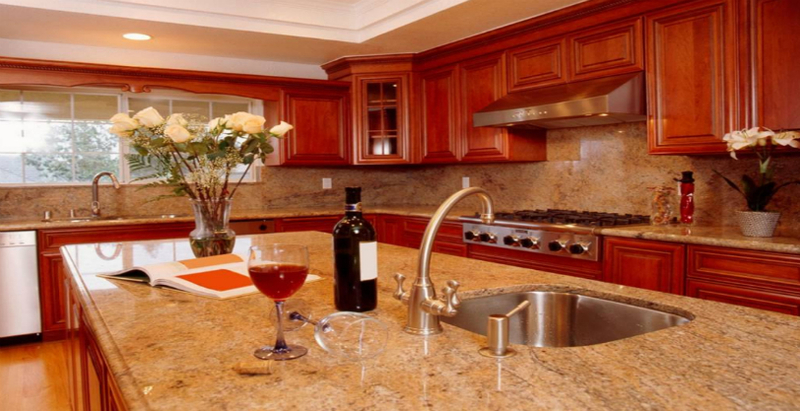 There is no need to disinfect granite countertops. Just make sure to seal them yearly and maintain them daily as recommended. 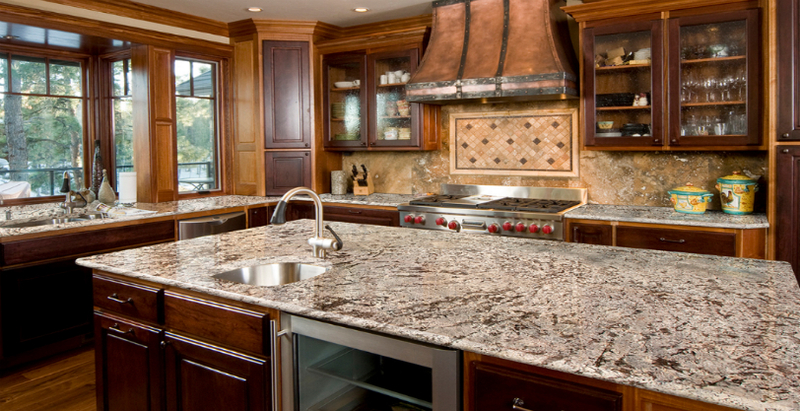 Granite is resistant to bacteria. Do I have to buy a whole slab of granite if I don’t need it? You don’t have to. We will come to your place and determine how much material do you need for your countertops. Aqua Kitchen and Bath Design Center in Wayne NJ will not charge you the full slabs price. 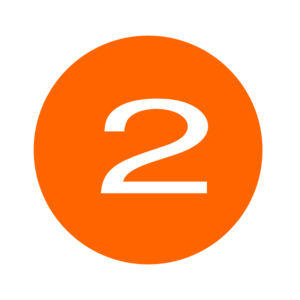 Plus, we will fabricate your granite countertops NJ for free and add any modifications you like. Praudly made in America! 100% Lifetime Warranty! Make a statement with custom kitchen cabinets with extra detailing options.